Come on down, grab a drink and spend your evening hanging out with old and new friends in support of the city’s performing arts. 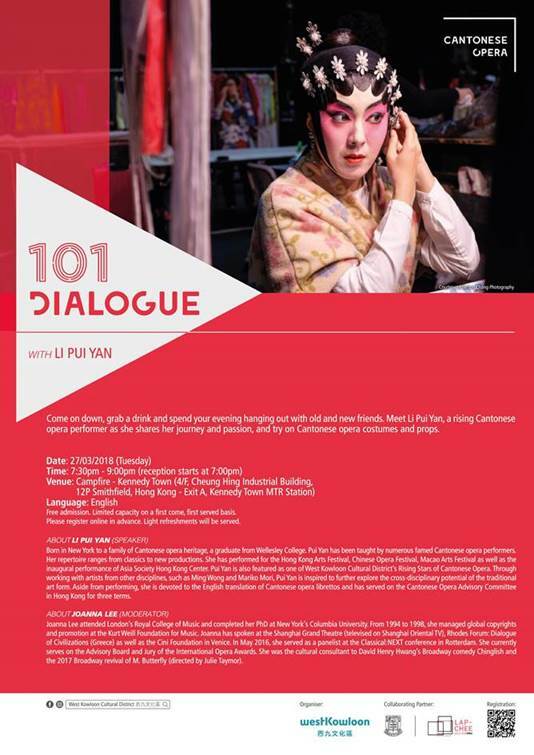 Meet Li Pui Yan, a rising Cantonese opera performer as she shares her journey and passion. Try on Cantonese opera costumes, join us in taking a behind-the-scene look at the fascinating world of Cantonese opera. Born in New York to a family of Cantonese opera heritage, a graduate from Wellesley College, Li has been taught by numerous famed Cantonese opera performers. Her repertoire ranges from classics to new productions. She has performed for the Hong Kong Arts Festival, Chinese Opera Festival, Macau Arts Festival as well as the benefit inaugural performance of Asia Society Hong Kong Center. Li is also featured as one of West Kowloon Cultural District’s Rising Stars of Cantonese Opera. Through working with artists from other disciplines, such as Ming Wong and Mariko Mori, Li is inspired to further explore the cross-disciplinary potential of the traditional art form. Aside from performing, Li is devoted to the English translation of Cantonese opera librettos and has served on the Cantonese Opera Advisory Committee in Hong Kong for three terms. Joanna Lee attended London’s Royal College of Music and completed her PhD at New York’s Columbia University. From 1994 to 1998, she managed global copyrights and promotion at the Kurt Weill Foundation for Music. Between 1998 and 2000, Joanna took over the business and contractual administration of the Grammy-winning, New-York based Orpheus Chamber Orchestra. She contributed 11 articles to the current New Grove Dictionary of Music and Musicians. She has spoken at the Shanghai Grand Theatre (televised on Shanghai Oriental TV), Rhodes Forum: Dialogue of Civilizations (Greece) as well as the Cini Foundation in Venice. In May 2016, she served as a panelist at the Classical:NEXT conference in Rotterdam. She currently serves on the Advisory Board and Jury of the International Opera Awards. She was the cultural consultant to David Henry Hwang’s Broadway comedy Chinglish and the 2017 Broadway revival of M Butterfly (directed by Julie Taymor).